Why is the color of lightning white or blue rather than nothing? According to my knowledge, when clouds get charged, they produce sparks, which look like lightning to us. My question is, why does lightning have a color? It consists of electrons, and should not radiate light. If it radiates light after hitting air particles, then it should radiate only X-rays. Is that correct? TL;DR: Air in lightning gets hot. Hot things (like the Sun) emit light in a broad spectrum; including visible. You are right there will be emissions outside the visible - but your eye doesn't pick that up. So the flash looks blue-ish white to the human eye. The light you see is the result of the air getting very, very hot. And just like the sun, which is very hot, is white - so is lightning. Electrons can emit radiation in a wide range of energies, depending on the rate of deceleration. When they hit a tungsten target in an X-ray tube, they decelerate very suddenly from a very high starting point - thus Xrays. If they start with "high thermal" energies, and decelerate by hitting (lower Z, lower density) air molecules, their spectrum will be more like a black body spectrum. A hot black body - white. But there is some X-ray component in lightning as well - you just can't see it, and most of it is absorbed in the air before it reaches you. 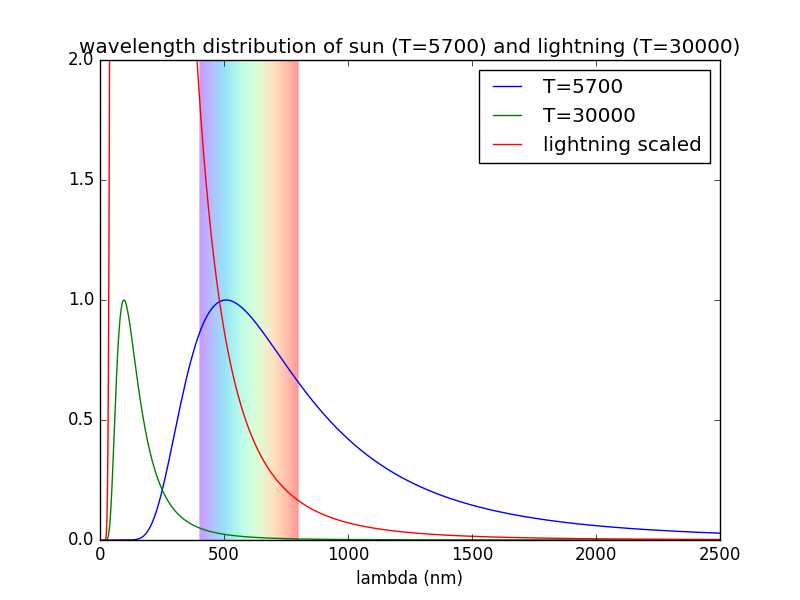 You can see that lightning (assuming a temperature of 30,000 K) gives off mostly "light" in the UV - but there is a component in the visible, which will be bluish - but which our eyes perceive as white. "Nobody understands how lightning makes X-rays," said Martin Uman, a professor of electrical and computer engineering. "Despite reaching temperatures five times hotter than the surface of the sun, the temperature of lightning is still thousands of times too cold to account for the X-rays observed." Such spectral broadening will help "whiten" the light some more. The question of X rays was brought up in the quote above. It is quite possible that some of the high energy electrons (which after all accelerate in a field of thousands of V/m) travel considerable distance (and therefore obtain significant energy) before hitting an air molecule - their sudden deceleration can then give rise to higher energy emissions, including X rays. The presence of such accelerated electrons is not well described by the black body radiation model, and it should therefore come as no surprise that there are things "beyond the predicted spectrum". The high voltage of the lightning arc separates electrons and ions, briefly forming a plasma. When the electrons and ions recombine back into a gas, the formerly free electrons drop to a lower energy state in orbit around their ions, and the energy difference is emitted as light. This is the bright flash that you see. Also, the newly recombined gas will be very hot, so it will glow briefly. The volume of hot gas is fairly small, so it can cool quickly and stop glowing. Not the answer you're looking for? Browse other questions tagged visible-light electromagnetic-radiation thermal-radiation lightning or ask your own question. Why should you stay in the car during thunderstorms? 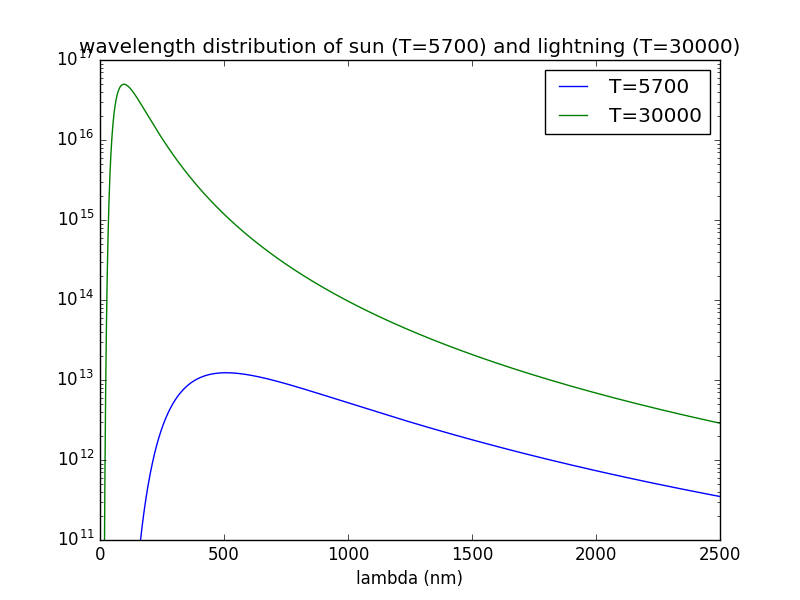 Why phase velocity of light is slower in a dielectric than vacuum? Why are some Air Gap Sparks Orange? Why don't conductive objects change color when electric dipoles are induced in them? Why don't planets radiate in orbit like a charged particle? Why are some materials dull rather than shiny (cloth, coal, matte paint etc.)? 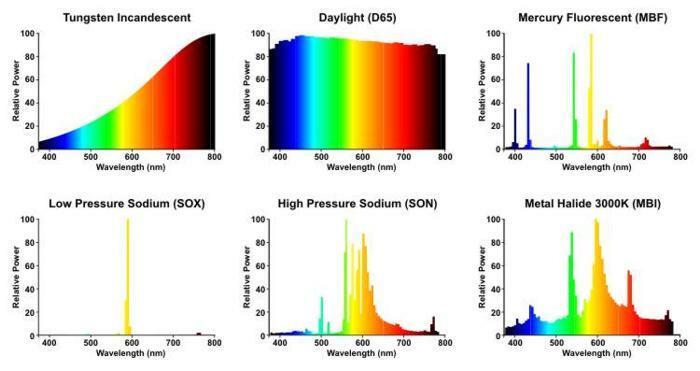 How to define white color scientifically?